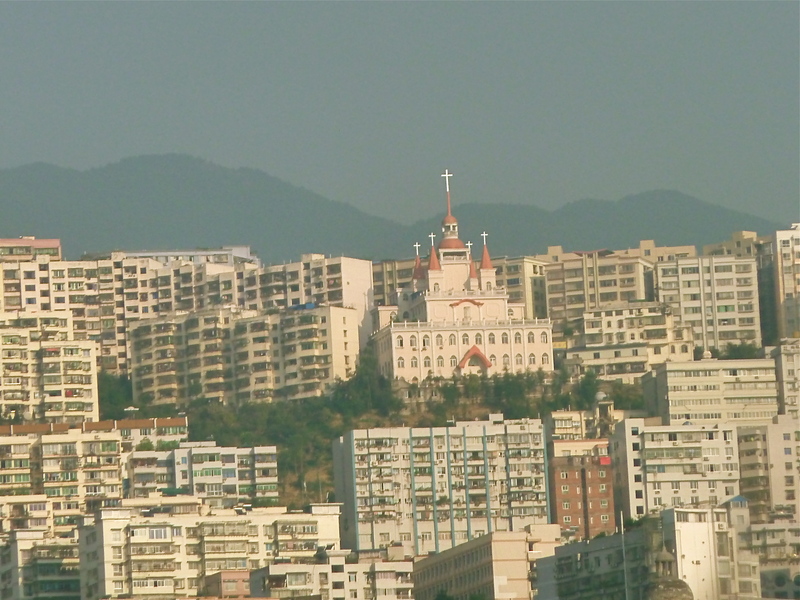 You are currently browsing the tag archive for the ‘Shanghai’ tag. 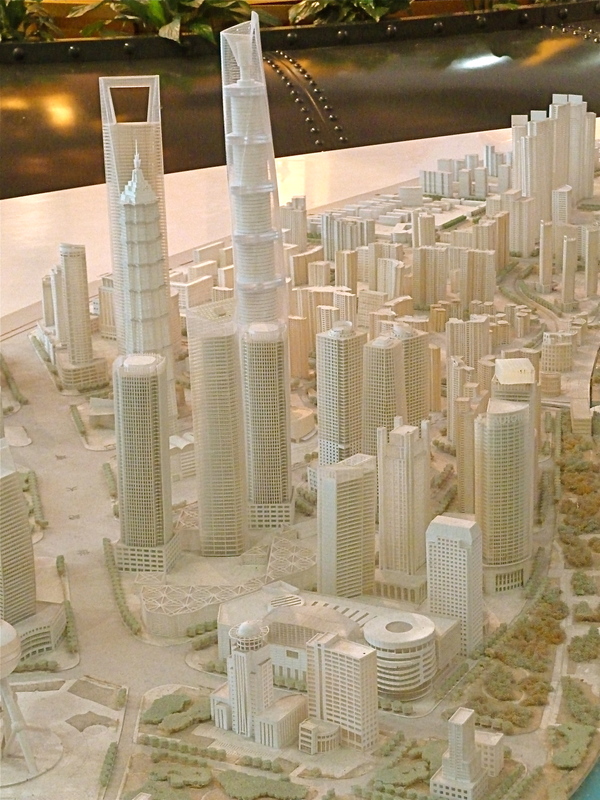 Does the world’s new financial hub rise in Shanghai? Lower Manhattan became famous, as it has for so many things when in the 30s, more than 200 skyscrapers (of more than 20 floors) were built there in a decade. 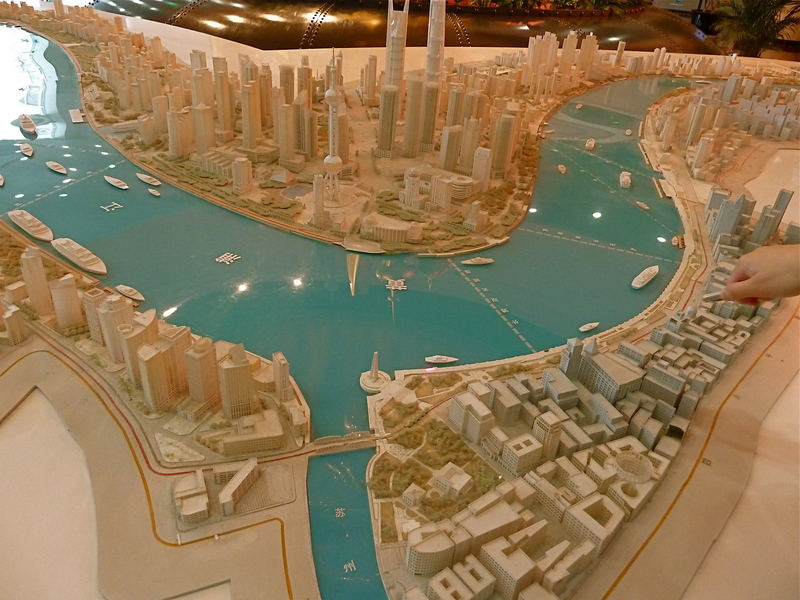 Since 1990, when Chinese Premier Deng proclaimed that Shanghai would build a world-class financial district on the mud flats across the river from Shanghai proper, some 400 skyscrapers have been built there. 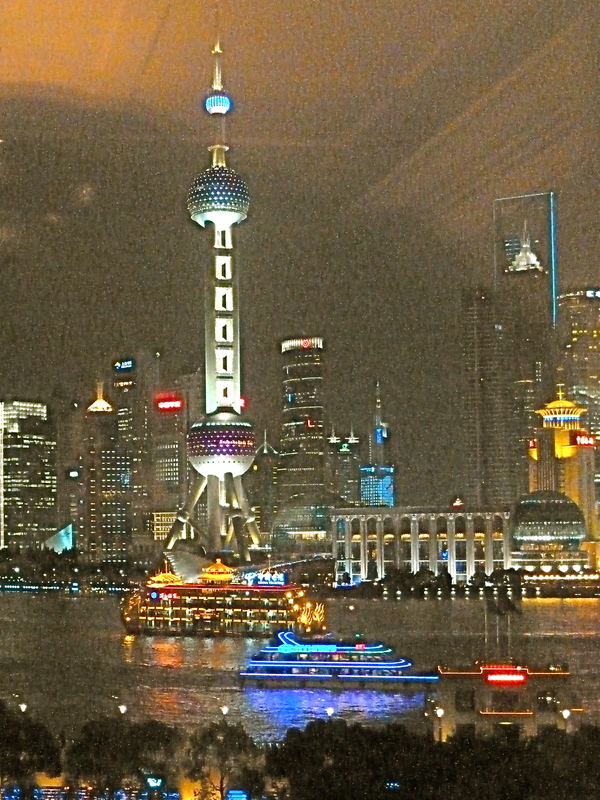 We recently visited, and viewed the awesome day and night skyline of the Pudong district, as it is known, both from our hotel rooms at the Peninsula Hotel on he famous Bund, across the river, and down from 93rd floor restaurant the Shanghai World Financial Center, in the Center of Pudong, now I believe the world’s 3rd tallest building. 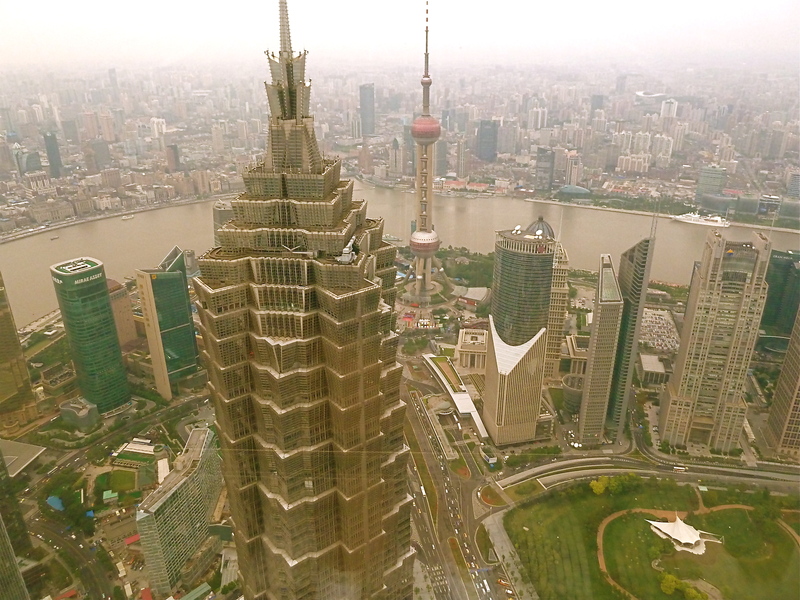 A Chicagoan, Marshall Strabala, is the lead architect of the Shanghai Tower, now under construction there, which will soon soar above the Financial Center. 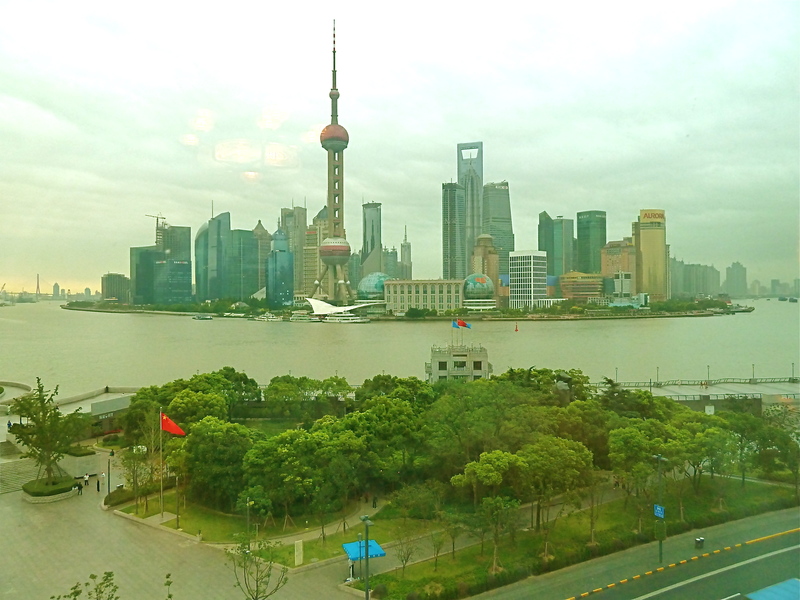 Seen from across the river, Pudong resembles a space-age version of the Financial District in Lower Manhattan. 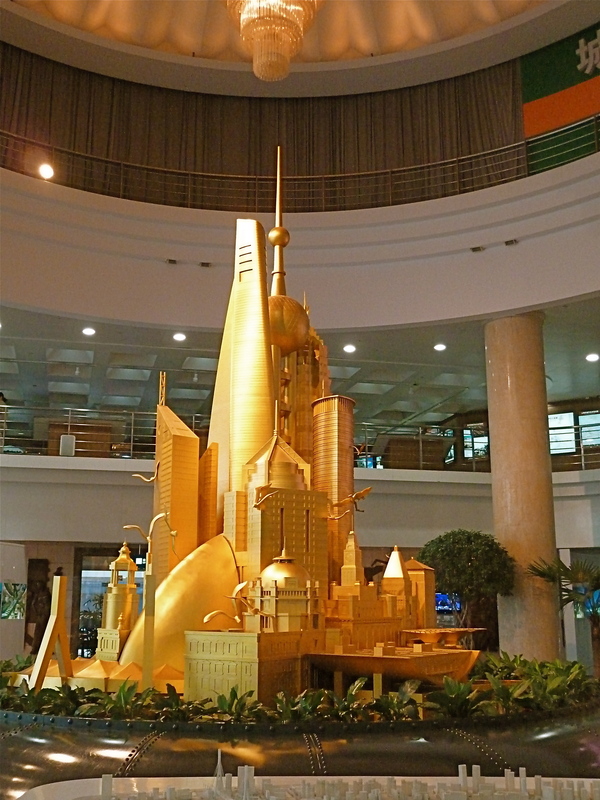 If architecture can connote such a thing, we may be looking at the world’s financial capitol of the 21st century. 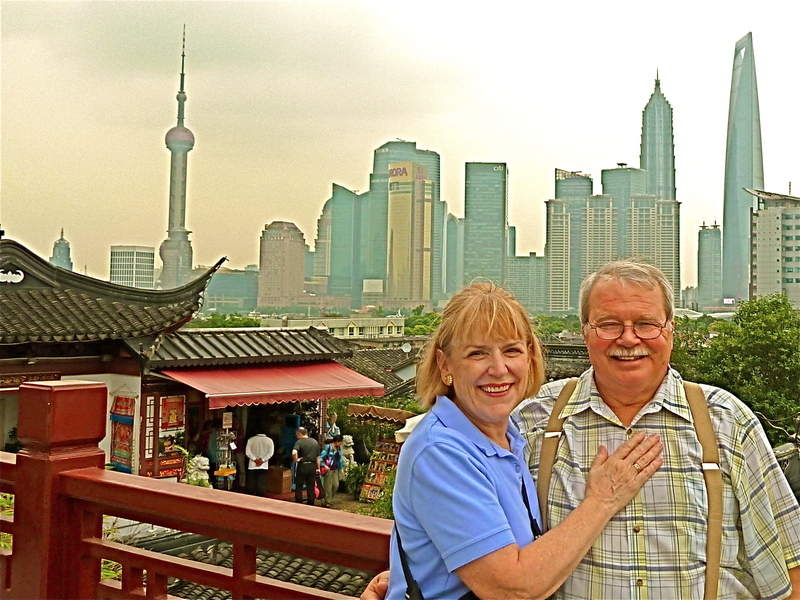 When we left Shanghai for the airport week before last, we decided to do so on the world’s fastest train, The Shanghai MagLev, a 19 mile magnetic levitation line completed in 2004 for a modest investment of $1.3 billion. It is the world’s only such line. 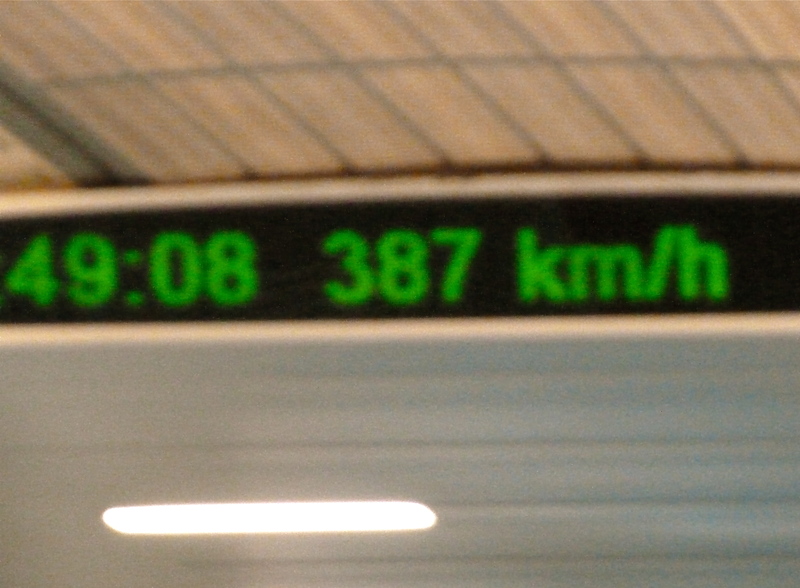 We actually took the photo of the speed meter as the train was slowing down. It hit 431 Km/h or 218 Mph on our 7 minute run to the airport. The acceleration and ride is totally smooth and quiet, and the cabins are wide and comfortable. If you sit on the side nearest the opposing track, as we’d been advised to do, you hear a sharp “crack” as the Mag Lev running the other way passes, at a combined speed of more than 400 Mph. The Mag Lev is a thrill, and the only land vehicle faster is the Bugatti Veyron sports car. The Shanghai MagLev is essentially a demonstration line, the Shanghai to Beijing line currently beginning development will be a conventional high speed railroad. I doubt that we’ll see a Mag Lev in America in our lifetimes, because of the extreme costs, but it is a wonder. 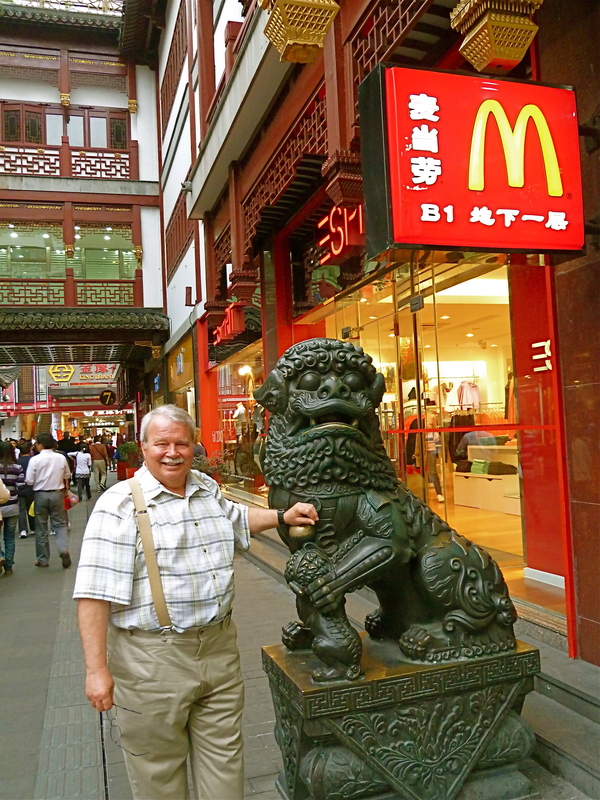 On our trip through China the past two weeks, we were driven in Chinese-made cars, as well as a Buick Regal. 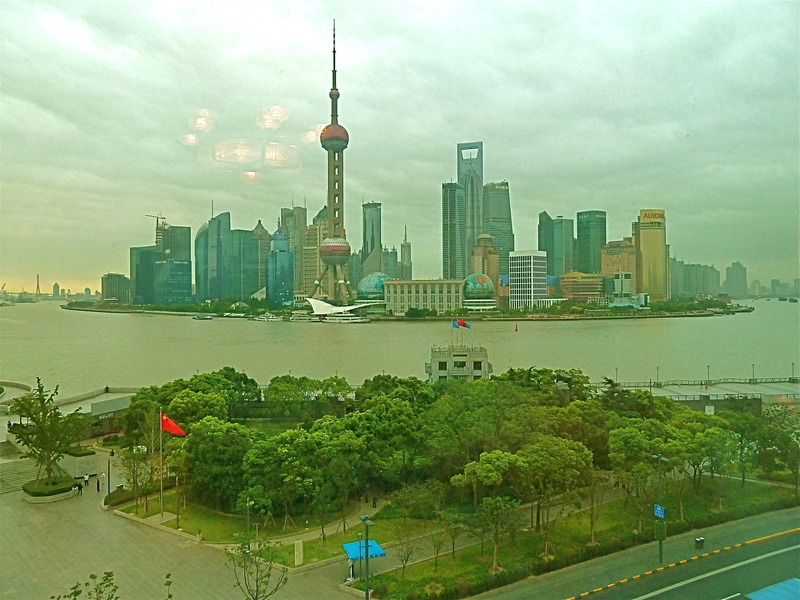 The Buicks are built in Shanghai, where they are considered a luxury brand. We saw them in every city and town we visited, and drove in a black one for 3 days in Beijing. An interesting Chinese brand is built by BYD, formerly a Chinese battery company that makes a lot of the world’s cell phone batteries. A guy named Warren Buffet has invested $250 million in BYD, which company PR lore says stands for either Build Your Dreams, or Bring Your Dollars — you pick. 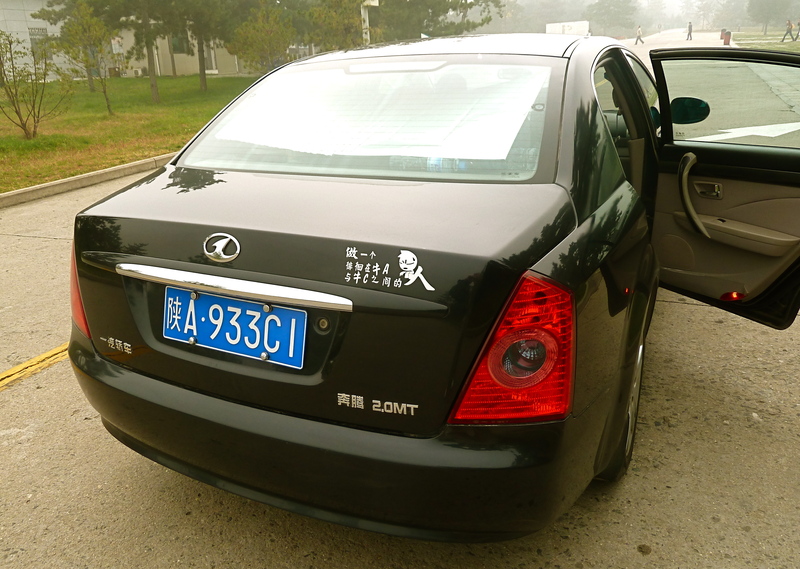 Another car we rode in, and it is shown here, is built by FAW (First Automobile Works) HongQi, a state-owned company, and has the look, fit and finish of a Lexus. FAW also builds a luxury limousine, including the one the President of China rides in, that sells for a modest $1.2 million. At the car-building city of Changchun, we saw dealers for virtually every global brand and saw car carrying trucks, each with 16 new Chinese cars aboard, by the hundred. China is now the largest automobile market in the world, out selling the U.S. by 60%, and its cars are nearly ready for the U.S. market. Watch for their EVs (electric vehicles). Warren Buffet is.